By LUDWIG VON KOOPA - Can't agree with you on everything, buddy. Rush Limbaugh is a cool guy. He's totally a blowhard and the definitive right-wing radio talkshow host. According to Al Sharpton, he's the leader of the Republican Party. If that's the case, then we might run into some issues. Oh, full disclosure: The only radio host I listen to regularly is Herman Cain. However, just for this article, which I wrote back in early 2014, I've listened to almost 6 months worth of Rush Limbaugh's 3-hour program at 12 PM EST every day. I wanted to make sure I was educated on what I was writing about before I published it. It turns out Mr. Limbaugh has the same "you have to read several articles/tune into the show many times before you get it" type thing KoopaTV does! Did you know he has children's books? Readers of KoopaTV know that I put the truth over partisanship. So let's look at the facts. According to the Entertainment Software Association, about 58% or more of all Americans play videogames, and 56% of parents think videogames have a positive impact on their child's life. Now, that pretty much means the average (median) American plays videogames and the average parent thinks videogames are a good thing. If we define normal as average, then it's not President Barack Hussein Obama defining videogame players as normal, it's the market. Of course, according to many people, normal doesn't mean anything and it's not average. For example, all those people who think heteronormativity is evil. Let's ignore them because they live in their own bubble. Just because they aren't normal and never will be doesn't mean the idea of normal should be completely rejected. However, let's be clear here: President Barack Hussein Obama does support egalitarianism. He wants equal results. Or he wouldn't want to spread the wealth around. KoopaTV's position is deep opposition. Mr. Limbaugh needs to realize that it is not a contradiction to play videogames yet still believe in the conservative, meritocratic principles that he does and our Founding Fathers did. 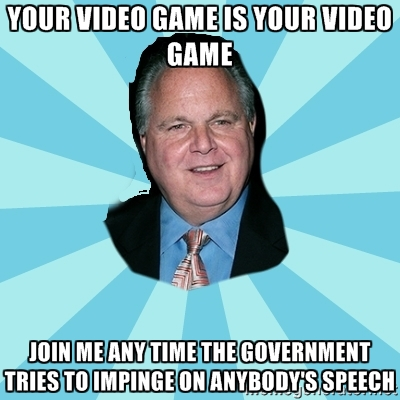 Mr. Limbaugh already defends videogames as an expression of the First Amendment, now he needs to defend them as... a viable activity. Or else you will die! Just kidding, he's not CD-i Ganon. As for many videogamers, they need to not associate the rightwing as "surprisingly" pro-First Amendment. It is the conservative position to be pro-First Amendment. Conservatives and libertarians are always for the Constitution. Progressives hate it, and want it to be a "living" document. What that means is that the freedoms and rights are not meant to be ironclad, but they are supposed to adapt and be free-flowing. When you're dealing with our freedom, you absolutely do not want that to be free-flowing. You want that to be as rigid and unwavering as possible, and principled conservatives will always be on the side of the Constitution. And I have to say, I'd rather side with someone who is ideologically principled to be on my side of things than an opportunist who is only doing it to look good or because they like videogames. NeoGAF defends free speech when it comes to videogames being sold (I think), but you don't see them consistently applying a defense of free speech on other things. That makes them a completely unreliable entity to be an ally with. Progressives hate freedom. 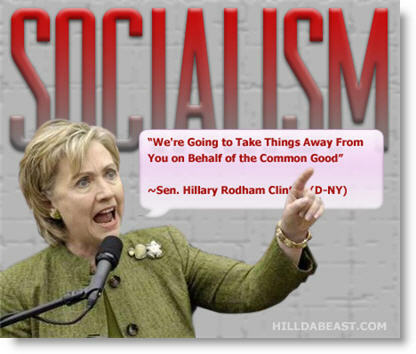 Look at the Queen of the Democrat Party, the anointed one without accomplishments, Hillary Clinton. She, and her Democrat Party buddies, wanted videogame sales restricted to minors. That sort of thing would completely make our eShop campaign irrelevant, because then Nintendo would be breaking the law if they made the change we want. Sure, the quote itself was out-of-context, but she literally thinks this way anyway. Let's work to end these misunderstandings. Freedom is the best policy, and videogaming is normal and not culturally regressive. The young people aren't all crazy progressive because they're videogamers: They're just idealistic young folk who don't know reality and want to feel like they're making a difference in the world. They also happen to play videogames. And just by sheer statistics, some make it ahead of others. Videogames do teach a set of soft skills to people, but I'll go over that in a later article I haven't written yet. Ludwig almost never likes what you have to say, but he'll defend your right to say it. Do you think the same about what he says? Ludwig even extends his speech principles to the likes of Anita Sarkeesian. Hillary wants to be your president. Ludwig wrote an entire article about the videogame sales restriction bill Hillary Clinton tried to pass. It's important to read.